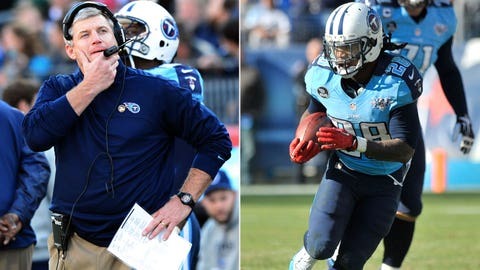 Head coach Mike Munchak (left) and Chris Johnson (141 total yards, one TD vs. Houston) are under contract for 2014, but that hasn't stopped the speculation surrounding both for next season. NASHVILLE, Tenn. — It was the season finale for the Titans, but the 16-10 win over visiting Houston might well have been the last game, period, for Tennessee’s coach and star running back. New Titans president and CEO Tommy Smith stated he would use how the team closed the season as part of the evaluation for whether coach Mike Munchak would return for a fourth season. As that goes, the Titans (7-9) finished with wins at Jacksonville (Week 16) and over the Texans (2-14) in front of an announced sellout crowd of 69,143 at LP Field, while also snapping a five-game home losing streak. "I have to think positively about that," Munchak said of returning next year. "I have to think that I have a great view of what’s going on. … I feel good about everything that we’re doing going forward. "I think I know what needs to be corrected. I know how I’d go forward. You hope they share that vision with you." But the Titans also lost eight of 10 games after opening 3-1 and will miss the playoffs for a fifth straight year. Munchak conceded that winning and making the postseason are ultimate markers for success, although the team’s 7-9 record was a small improvement over last year’s 6-10 finish. "We just got to win football games," said Munchak, who is 22-26 as Titans coach. "We did win the last two, and that’s all we can do at this point, once we didn’t win enough earlier.
" … So, we’ll see. I feel real good about this team, how we have grown as a team throughout the year. I see it firsthand every day." If it was indeed a Titans swan song for sixth-year running back Chris Johnson, he made it a good one. Johnson rushed for 127 yards and scored the game-clinching touchdown on an 11-yard carry in the third quarter. But Johnson’s contract calls for him to make $8 million for 2014 and 2015 and then $7 million in 2016, the final year of his current deal. While it might be prohibitive for the Titans to pay Johnson that much money compared to his productivity, the team’s 2008 first-round draft pick might be open to renegotiating with Tennessee during the offseason. "I feel like everybody was playing or everybody’s job," Johnson said of how he approached Sunday’s game. "Nobody knows who’s going to be here or somewhere else next year. Nobody knows who’s even going to be playing football next year." While rushing for more than 100 yards for only the second time this season and first time at home, Johnson finished with 1,077 rushing yards — the second-lowest output of his career. However, Johnson also became just the sixth back in NFL history to gain 1,000 yards or more in his first six seasons, joining Barry Sanders, Curtis Martin, LaDainian Tomlinson, Eric Dickerson and Corey Dillon. Ranking third in franchise history with 7,965 career rushing yards, Johnson admitted to thinking about what Sunday’s game might ultimately mean. "I gave a thought to that even just running out of the tunnel (onto the field) about possibly being my last game in a Tennessee uniform," he said. "You know you give it a thought. But at the end of the day, you can’t let that affect how you play in the game." The loss was the Texans’ franchise-record 14th straight to close the season, after opening 2-0. After eighth-year coach Gary Kubiak was fired on Dec. 6, defensive coordinator Wade Phillips was named interim coach. "I had some personal things to go through (this season)," said Phillips, whose father, former Houston Oilers coach Bum Phillips, died on Oct. 18. "It was a tough year that way, and then the way our season went. I still believe the guys played hard. "I didn’t ask them to win every game. I asked them to play hard, and I thought they did that." The Texans returned to former starting quarterback Matt Schaub, after he was benched for Case Keenum midway through the season, for Houston’s final two games. Against the Titans, Schaub completed 22 of 34 passes for 229 yards with zero touchdowns, two interceptions and a 59.6 rating. Conversely, the Titans went nine games without injured starting quarterback Jake Locker. He was relieved by Ryan Fitzpatrick, who went 3-6 as a starter. Against the Texans, he completed 15 of 24 passes for 166 yards with zero touchdowns, one interception and a 65.6 rating. "I think it shows a lot about the character and the professionalism in our locker room," Fitzpatrick said of the team’s finish that included an overtime home loss to the Cardinals in Week 15. "I think it shows a lot about coach Munchak and just everybody continuing to play throughout the whole season, even when the playoffs and that picture went away." After trailing 7-6 at halftime, Johnson’s go-ahead touchdown in the third quarter capped a 65-yard scoring drive, which started after Schaub was intercepted by linebacker Akeem Ayers. The defense picked up their third of four takeaways when Schaub’s fumbled snap was recovered by defensive tackle Sammie Hill at the Texans’ 34. Six plays later, kicker Rob Bironas give the Titans a 16-7 lead with a 37-yarder early in the fourth quarter. The Texans responded by driving 79 yards to the Titans’ 1, before settling for a 19-yard field goal by kicker Randy Bullock (2:53 remaining). The big play: Schaub tossed a short pass to running back Jonathan Grimes, who then raced for 31 yards. Tennessee’s last takeaway was an interception on Houston’s final possession by free safety Michael Griffin near midfield, snuffing out any chances of a Texans comeback. When pressed about what went wrong this season, Schaub succinctly said "everything." He then added: "Situational football, turning it over, giving teams opportunities, penalties, not staying on the field on third down, not getting off the field sometimes on third down, and just so many things." On the Texans’ touchdown drive to start the game, Schaub completed four straight passes to Andre Johnson (six catches, 49 yards) and rookie DeAndre Hopkins (two apiece) and then relied on Grimes for 34 rushing yards. Following an 18-yard punt return by Leon Washington, the Titans started at their own 44-yard line. But they could only muster two first downs and had to settle for a Bironas field goal (42 yards), cutting the early deficit to four (7-3). From there, the teams exchanged turnovers. Houston drove to the Tennessee 30, before Grimes fumbled after being hit by Titans linebacker Akeem Ayers. But after picking up just one first down, the Titans handed the ball right back to the Texans when Fitzpatrick was hit by Houston defensive end Antonio Smith during a throw, causing the ball to flutter and eventually be intercepted by cornerback Brice McCain. Bironas pulled the Titans to within 7-6 at halftime with a 55-yard field goal as time expired. It capped a drive that started at the Tennessee 5-yard line and stalled at the Texans’ 37. Johnson started the drive with a 23-yard run to put him over the 1,000-yard mark. "I don’t think we are that far off," Munchak said. "I think you saw that in the way we played this year."